Built to make you win. TRAIN SMART. GET FIT. BE LEAN. FEEL STRONG. Built to make you win. A new approach to fitness software has been born. Your CardioGuru removes the doubt on how to train for sustainable and safe fat loss through increased fitness levels. Use "Your CardioGuru" to set daily training targets, and select the best workout at the right time . Your CardioGuru is your very own pocket coach that can instruct, countdown each interval, time each workout, push you to the correct training intensity and track your performance. Your CardioGuru has been developed by leading fitness experts to help remove the confusion surrounding HIIT/Cardio training and help improve the training performances of both men & women of all fitness abilities. Started using @thecardioguru app along side the @wattbike this week. Incredible app and very easy to use. Key for serious fitness results. 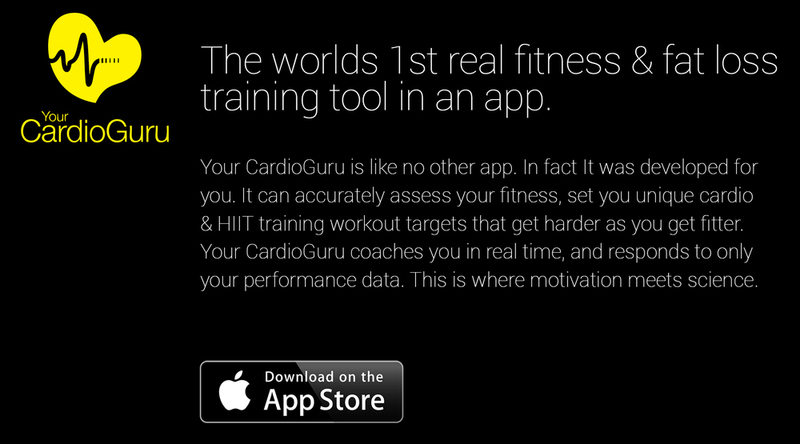 We recommend consulting a medical professional before using the cardio guru fitness app. Fat loss and increased fitness will only occur with a balanced diet and regular exercise. Software that adapts to all fitness abilities. Data extracted from the simple to use yet comprehensive inbuilt fitness assessment drives the software to be both unique and personalised to each user’s body and fitness targets. Your CardioGuru continually updates your personal fitness data and at the end of each workout your performance data is analysed and key fitness analytics are then recorded so that fitness baseline and training targets can be updated.